Papers & Presents rolls into and pops up at The Street this Friday, May 20th. 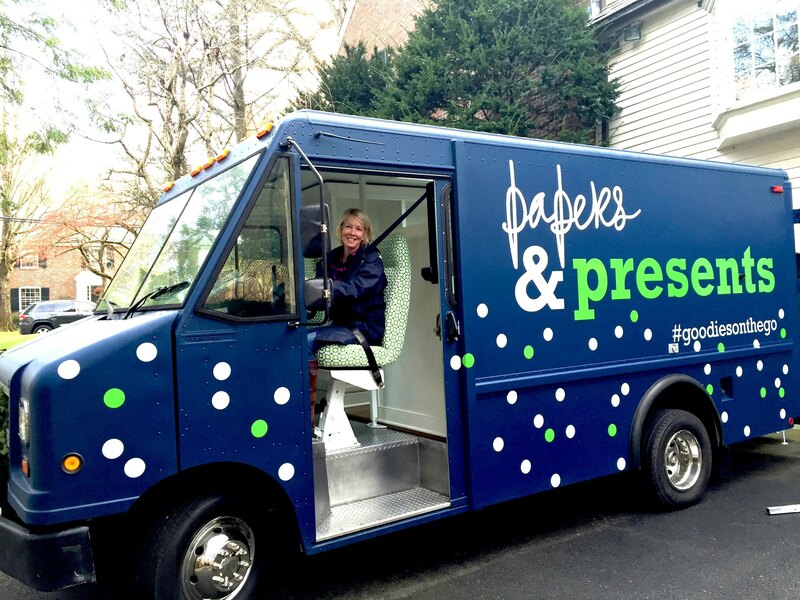 As part of its activation, Papers & Presents will officially launch Penelope, the country’s first stationery boutique on wheels, to the public and will offer a comprehensive gift shop experience through The Pop-Up. The adorable, custom-made truck will be parked directly in front of Papers & Presents at The Pop-Up (3 Boylston Street, next to Star Market and MiniLuxe). Perfectly timed to graduation and wedding season, Papers & Presents is open daily, Friday, May 20, 2016 through June 13, 2016 from 10am-6pm. Between The Pop-Up and Penelope, the Papers & Presents shopping experience at The Street will offer a colorful selection of customizable gifts, party supplies and stationery that is expertly curated by owner Carolyn McCoy. McCoy started her business in 1988, selling stationery, invitations, and birth announcements via the trunk of her car. After running a beloved storefront in Wellesley for 16 years, McCoy recently closed her shop and created Penelope to allow for maximum freedom and flexibility. Penelope is a beautiful and petite 90 square feet. She features a skylight, hardwood floors, Jonathan Adler upholstery, a custom bookcase with uplighting, and a desk and bulletin board chock full of stationery and invitation displays. Popular items found both within The Pop-Up and Penelope include catchy cocktail napkins (like those that read Rosé all day), fleece blankets with college logos that can be customized with students initials and class year, monogrammed totes, laundry bags, Lucite trays, catchalls, clutches, accessories, and of course an array of personalized stationary, classic correspondence cards, and notepads. Papers & Presents can also monogram gifts purchased elsewhere.